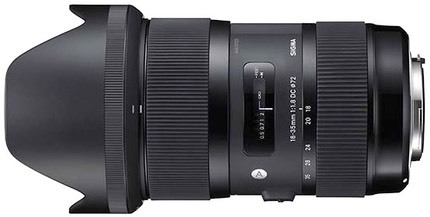 Sigma today preannounced (no price or availability) a new crop sensor lens that is certainly going to attract attention: an f/1.8 mid-range DX zoom: the 18-35mm f/1.8 DC HSM. Yes, constant aperture f/1.8. While a bit large and heavy (about 5" long and 28.6 ounces[121mm, 810g]), it's the first lens to bring a high level of equivalence to the DX crop. Since "equivalence" means different things to different people, let me explain: I mean it allows a DX shooter to get basically the same picture from the same spot as an FX user. It's not quite a perfect equivalence, as the FX shooter is probably using a 24-70mm as their fast mid-range zoom, and the new Sigma is only a 27-52mm equivalent in terms of angle of view, so the DX user is clipped a bit at the two focal extremes, but in the overlapping focal range, the DX user should now be able to get the same DOF isolation as the FX user. Other things you'll want to know: 72mm front filter threads, 11" (.28m) close focus, 9-blade aperture diaphragm (though it only goes to f/16), and an HSM internal focus motor. The lens doesn't change length or rotate the front element while focusing and zooming, a nice touch. All in all, one of the more interesting DX lenses to come around in a long, long time. Of course, we don't know when it will actually appear or at what price, nor do we know how it'll perform. Nonetheless, one would have to say that Sigma mostly gets it when it comes to serious DX lens needs, and Nikon once again is left fiddling with mass market, lowest common denominator stuff despite having established the DX market in the first place. Now if we only had that ultimate (D400) DX body to put something like this on. Balls in your court Nikon. Stop dropping it.